Put in the work, harden your strengths, apply them to industry, come out better than you started. The array of events to compete in reflects the diversity of business applications in the workplace. From Accounting to Sports and Entertainment Marketing, students will find an area of interest to pursue. To maximize success, choose a category that best matches your knowledge, experience, and access to resources (i.e. if your older sister is a Chartered Accountant, try the Accounting or Finance events and train with her). 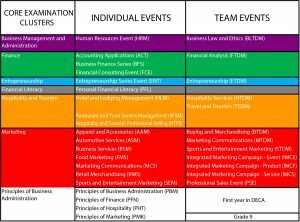 The document below contains a list of all events offered by DECA Ontario along with a link to a sample case/topic to help you decide which category is best for you. Availability of these events may vary depending on the level of competition (i.e. 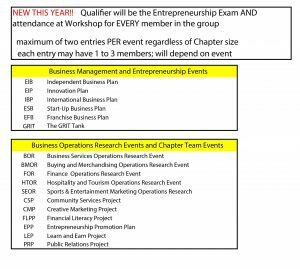 no written events at Regionals) and the size of your chapter (i.e. members of a chapter must fill every event category before additional participants for the same categories will be considered). Please see specific details about each competition under Competitive Events Listing. These events are NOT run by DECA Ontario and will NOT be competing at Provincials; qualifiers for ICDC are determined by DECA Inc. Notifications are emailed at the end of each round. *Reserved for 1st-year DECA members regardless of grade unless otherwise noted. The 2018-2019 topic for each career category is the development of a cause marketing campaign. Participants will collaborate with a local business or organization to analyze current customer perceptions of the company or organization’s corporate social responsibility. Participants will then present a strategic plan to create a cause marketing campaign that aligns to the company or organization’s core values. The GRIT Tank NEW THIS YEAR!!! Theme will be an Engineering Consulting Event sponsored by McMaster Faculty of Engineering. Three $5 000 DECA Scholarships will be awarded towards tuition; restrictions may apply. The following events must submit a good copy of their report based on the specific guidelines outlined in the DECA Guide. It will be read by the Judge. Unlike the US guidelines, a report/research notes/powerpoint presentation slides must be submitted. NO standardized guidelines are required so the student can include whatever they feel is relevant to be read by the Judge. Am I Allowed to Improve My Project Before ICDC? Competition Tips from ICDC Finalists to Help You at #DECAICDC 2017! Why Is Your Competitive Event Test So Important?